On the street level of the Fairmont Singapore, there's an excellent Italiant restaurant serving true Italian fare in a casual and welcoming country setting. Prego caters for the needs of all business travelers looking to relax and enjoy authentic Italian cuisine. Whether for the breakfast, a light bite or a proper Italian meal with Antipasti, Primi and Secondi Piatti, Pizza and Dolci, you'll be spoiled for choice and flavours at Prego. The 3-course Chef's Lunch Set menu is at S$48++ while the 4-course Chef's Dinner Set menu is at S$68++. The Fairmont Continental breakfast is at S$37++ and the hearty American Breakfast is at S$47. 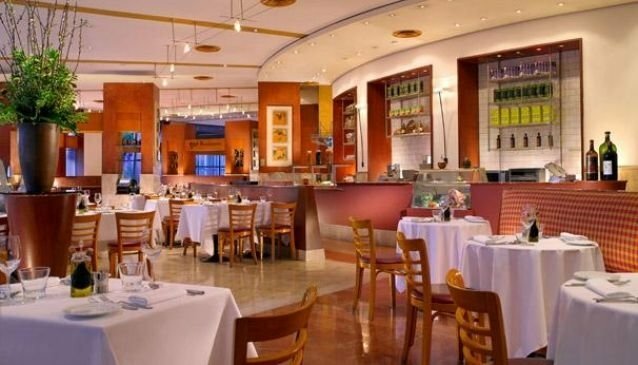 On Sundays between 12.30-3pm, Prego hosts a Lunch Semi-Buffet. Deli: Daily from 6am to 10.30pm. Pizzeria: From Monday to Saturday from 11.30am to 12.30am.